Over the last several years, we’ve begun to evaluate our prairie restoration work beyond just looking at plant communities. Our primary objective for restoration is to functionally enlarge and reconnect fragmented remnant (unplowed) prairies by restoring the land parcels around and between them. (See more on that topic here.) Because of that, it’s pretty important that we look at whether or not species – plant and animal – living in those remnant prairies are actually using and moving through our restored prairies. 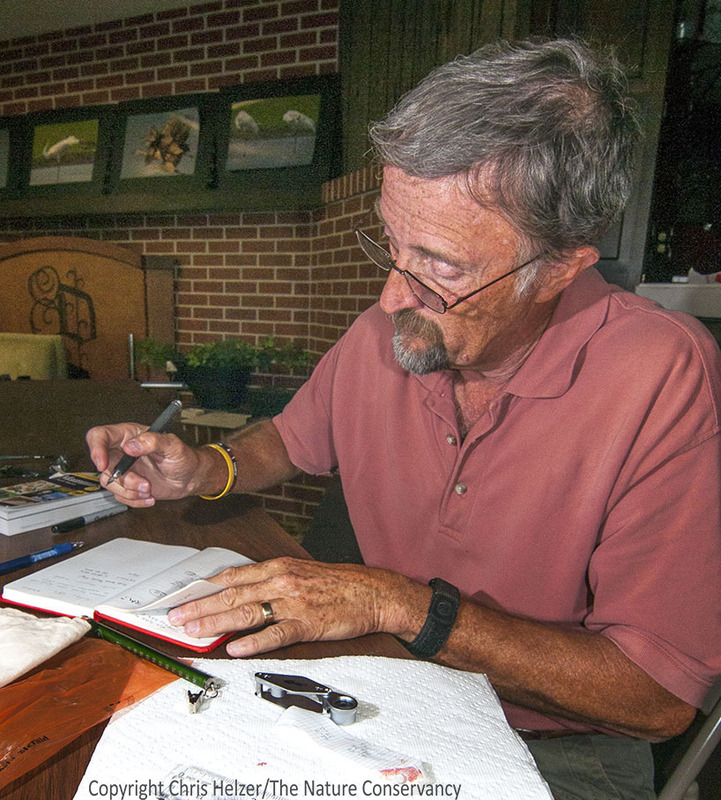 In 2012, we brought James Trager and Mike Arduser to our Platte River Prairies to help us start measuring our success in terms of ants and bees, respectively. We’re still early in that effort, but things look good for both so far. Most ant and bee species living in our prairie remnants are also showing up in nearby restored prairies. A deer mouse peers out of the thatch. Now we’re hoping to find similar patterns with small mammals. 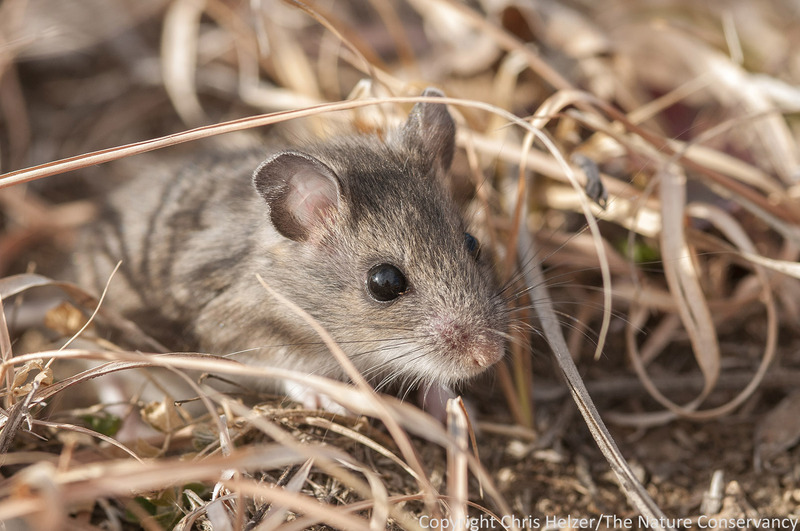 Mike Schrad, a Nebraska Master Naturalist, has volunteered to help us see whether the small mammal species in our remnant prairies are also in adjacent restored prairies. We’ve begun by looking at a single 200 acre prairie complex that consists of a remnant prairie surrounded by several restored prairies (former crop fields seeded with 150 or more plant species back in the mid-1990’s). Mike came out for three nighttime sampling periods in 2013 to see what he could catch in the remnant prairie and one of the adjacent restored prairies. On the one hand, seeing the same species in both remnant and restored prairie might not seem very surprising. Our restored prairies have the same plant species in them as the remnant prairies, and are managed the same way. It seems likely that small mammals can find everything they need for food and shelter there. On the other hand, it’s dangerous to blindly assume that we’re providing for the needs of all species when we restore prairies. The mouse and vole species we saw this year have been pretty well studied, but we still don’t know everything about what they need to survive. What looks like two identical habitats to us might be very different to a 2 inch tall little critter. For those reasons, it’s nice to see some support for our assumptions – though we still need much more data. Mike Schrad records data from one of his trapping efforts. Mike is a Nebraska Master Naturalist, one of many volunteers being deployed around the state to help with conservation and science projects. Over the next month or two, Mike and I will be planning future sampling efforts. Ideally, we’ll repeat the same kind of trapping he did in 2013, but do so at other sites were we have adjacent remnant and restored prairies. If we continue to see the same pattern of use – the species in the remnant prairie also using adjacent restored prairie – I’ll start to feel even better about our ability to defragment prairies from a small mammals’ perspective. However, even if we continue to see results similar to this year, there will be more to learn. 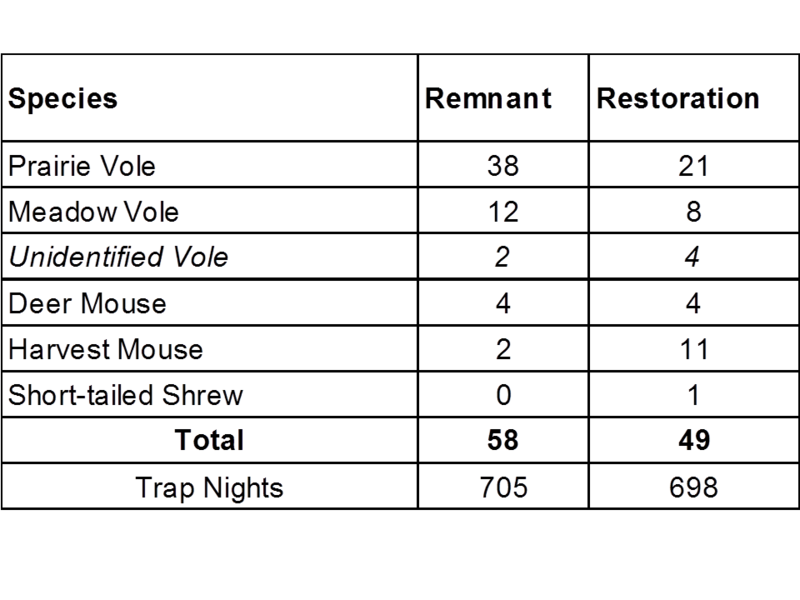 First, there are several less common species of small mammals in our prairies (we think) that weren’t caught this year. Two of those are plains pocket mouse and plains harvest mouse, both of which could be in our upland areas and are priority conservation species in Nebraska. Another is Franklin’s ground squirrel, a species we see periodically in our lowlands, but which has disappeared from most tallgrass prairies in the eastern U.S. I’d like to know that we’re creating habitat for those less common species, as well as for the common ones we caught this year. There is still a lot to learn about how well our restored prairies are working. However, with each step we take, I feel a little better about our ability to reduce the impacts of habitat fragmentation by restoring strategic parcels around and between prairie fragments. Knowing we can do it doesn’t make it economically or socially feasible, but those other factors are irrelevant if we can’t solve the technical issues first – and prove that we’ve done so. Prairie restoration can be a powerful tool for grassland conservation, but we’re not taking advantage of its full potential. Too often, we think and talk about prairie restoration (aka prairie reconstruction) in the wrong way. Instead of trying to restore an ecosystem, we try to reproduce history. Nelson Winkel, land manager for The Nature Conservancy’s Platte River Prairies, harvests grass seed using a pull-behind seed stripper. I was in Washington D.C. a couple weeks ago and visited Ford’s theater, where President Lincoln was assassinated in 1865. After the death of the president, the building went through drastic changes, including being completely gutted after a partial collapse of the interior. By the time the decision was made to restore the building for use as a historic site, the National Park Service basically had to start from scratch. Regardless, through painstaking research and a lot of hard work, the theater was rebuilt to closely resemble Ford’s theater of 1865. The rebuilding of Ford’s theater is a decent metaphor for much of the early prairie restoration (or reconstruction) work dating back to the 1930’s in North America – as well for some of the restoration work that continues today. In the case of prairie restoration, someone identifies a tract of land that used to be prairie but has been converted into something completely different (usually cropland), and tries their best to restore what was there before it was converted. Just as in the restoration of Ford’s theater, the prairie restoration process requires lot of research and hard work to identify, find, and reassemble what had been there before. Unfortunately, the Ford’s theater approach has turned out to be a poor fit for prairie restoration. Prairies aren’t buildings that have specific architectural plans and well-defined pieces that can be collected and assembled to create a pre-defined end product. Prairies are dynamic ecosystems that are constantly changing and evolving, and their components include organisms that interact with each other in complex ways. Trying to recreate a prairie that looks and functions just as it used to – especially on a small isolated tract of land – is nearly impossible. Reseeded prairie at The Nature Conservancy’s Kankakee Sands Restoration Project in Indiana. If the plant community today looks different than it did before it was farmed, is that really a failure of the restoration project? That doesn’t mean small scale prairie restoration is a bad idea. I think reestablishing vegetation that is similar to what was at a site many years ago can have tremendous historic and educational value, and can also provide important habitat for many grassland species. Where this kind of prairie restoration falls flat is when we expect too much from it. It’s really easy to find glaring differences between the restored prairie and what we know or think used to be there – soil characteristics are different, insect and wildlife species are missing, plant species are too common or too rare, etc. These “failures” have led some people in conservation and academia to become disillusioned with the whole concept of prairie restoration. In reality, prairie restoration has proven to be very successful, and is a tremendous tool for grassland conservation. We just need to find and apply a better metaphor. Unlike efforts to restore old buildings, prairie restoration projects should not be aimed at recreating something exactly as it existed long ago. Instead, effective prairie restoration should be like rebuilding a city after large portions of it are destroyed in a major disaster. When reconstructing a metropolitan area, replicating individual structures is much less important than restoring the processes the inhabitants of the city rely on. The people living and working in a city depend upon the restoration of power, transportation, communication, and other similar functions. Those people don’t care whether roads, power lines, or communication towers are put back exactly as they were before – they just want to be able to get the supplies and information they need, and to travel around so they can to do their jobs and survive. Restoration success is not measured by how much the rebuilt areas resemble the preexisting areas, but by whether or not the city and its citizens can survive and thrive again. Similarly, restoration of fragmented prairie landscapes should not be an attempt to recreate history. It should be an attempt to rebuild the viability of the species – and, more importantly, the processes – that make the prairie ecosystem function and thrive. Success shouldn’t be measured at the scale of individual restoration projects, but at the scale of the resultant complex of remnant and restored prairies. Are habitat patches sufficiently large that area-sensitive birds can nest successfully? Are insects and animals able to travel through that prairie complex to forage, mate, and disperse? Are ecological processes like seed dispersal and pollination occurring between the various patches of habitat? When a species’ population is wiped out in one part of the prairie because of a fire, disease, or other factor, is it able to recolonize from nearby areas? 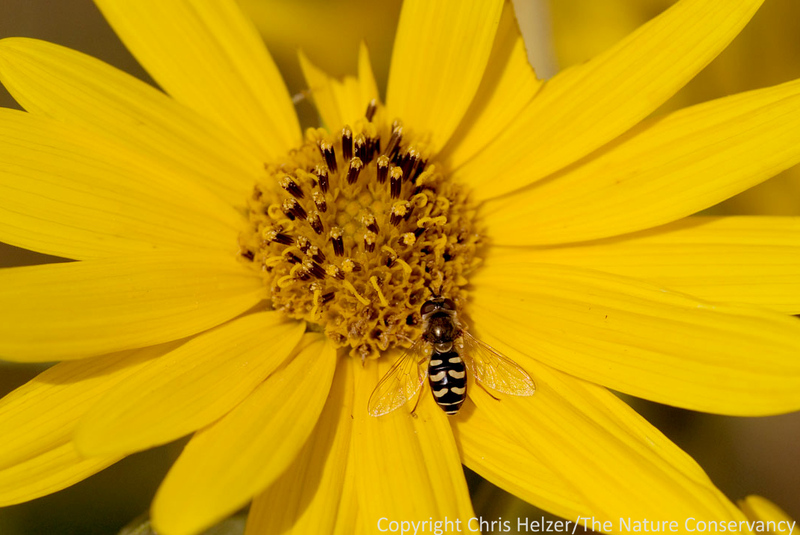 Pollination is an example of an important process that drives prairie function. 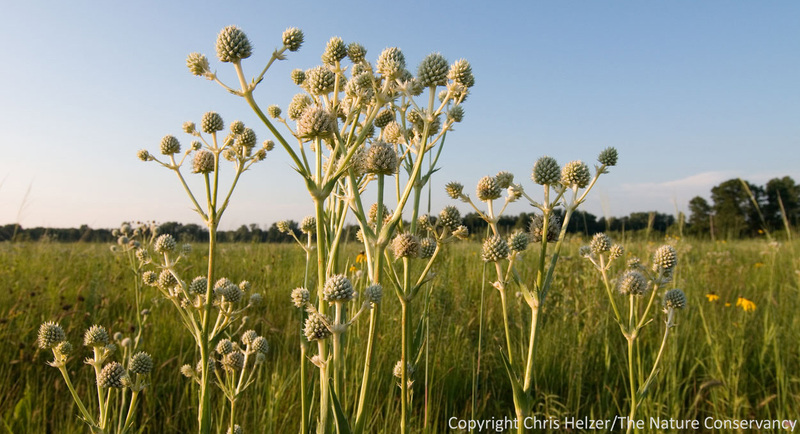 Increasing the size and/or connectivity of prairies by restoring areas around and between prairie fragments can enhance the viability of pollination and other processes. At first glance, choosing the appropriate metaphor for prairie restoration may seem insignificant compared to other challenges we face in grassland conservation. However, if we’re going to successfully restore the viability of fragmented prairies, we can’t afford to waste time and effort worrying about whether or not we’ve matched pre-European settlement condition, or any other historical benchmark. Instead, we need to focus on patching the essential systems back together. After all, we’re not building for the past, we’re building for the future. – An earlier blog post about using prairie restoration as a landscape scale conservation tool. – A prairie restoration project case study, with ideas about how to measure its success. – Some recent early attempts we’ve made to measure restoration success by looking at the responses of bees and ants. – A post about the importance and definition of ecological resilience in prairies.